A biopic about scientist Stephen Hawking, The Theory Of Everything is a romance highlighting a couple's unglamorous struggle against a vicious disease before Hawking achieved fame for his theories about space and time. At Cambridge University in the 1960s, a young Stephen Hawking (Eddie Redmayne) is an awkward but brilliant physics student. He gains an interest in the origins of time, and starts a romance with Jane Wilde (Felicity Jones). Just as Stephen is setting his research direction and getting serious about Jane, he is diagnosed with a motor neuron disease, a condition that will atrophy his body but keep his brain intact. He is given two years to live. Jane insists on marrying him anyway, and they start a family which eventually grows to include three children. Stephen's condition does not prove to be fatal, but he gradually loses control of most of his muscles, although he keeps on working and developing groundbreaking scientific theories. Jane holds the family together as best as she can, but with Stephen permanently confined to a wheelchair, she finally realizes that help is needed. Local church choir leader Jonathan Jones (Charlie Cox) volunteers to share the physical and emotional load, and he and Jane develop feelings for each other. Meanwhile, tarty nurse Elaine Mason (Maxine Peake) starts to play a larger role in Stephen's life. With the help of revolutionary computer-assisted technology Stephen writes and publishes A Brief History of Time, achieving scientific celebrity status but also fundamentally changing the household dynamic. A mass entertainment biographical film about Stephen Hawking was never going to be about theoretical physics, and The Theory Of Everything steers as far away from the topic as possible without ignoring it all together. 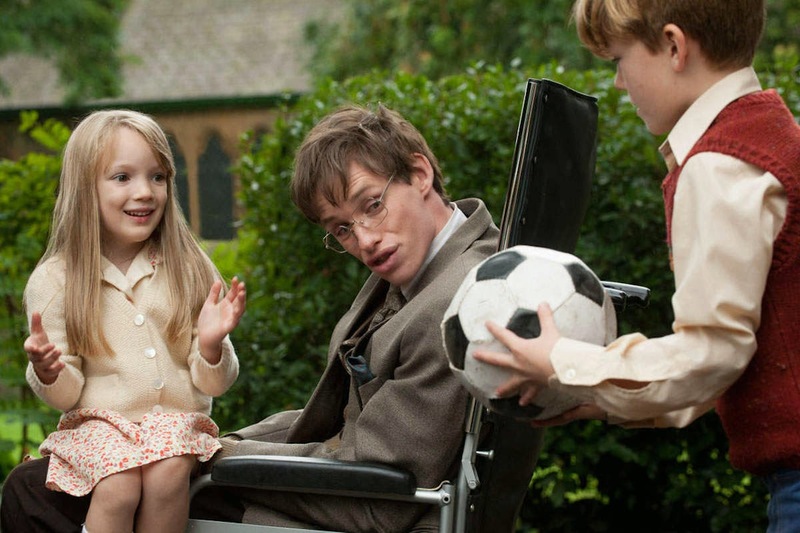 The film is based on the book Travelling to Infinity: My Life with Stephen by Jane Wilde Hawking, and so has it roots in an exploration of the family man rather than the scientist. The smatterings of physics and astronomy that do make it into the film revolve around the most superficial conversations about black holes and the origins of the universe, with most of subtext invested in whether the role of God in the creation of the universe can be consistent with emerging scientific theories. With the science that made the man pushed to the edges of the story, The Theory Of Everything settles down to portray a romance, a familial struggle against disability, and finally two people drifting apart as Hawking's work propels him into the spotlight of what passes as celebrity in the scientific community. Many of the film's elements are familiar from previous fare such as A Beautiful Mind (scientist battles illness with help from wife and achieves peer recognition) and My Left Foot (artist battles handicap and achieves fame). The Theory Of Everything never reaches the emotional heights of Ron Howard' classic, but neither does it get consumed by the disability angle. Director James Marsh finds the space where real people live and struggle to stay alive and relevant, and creates a film that quietly celebrates the human spirit. Eddie Redmayne gets half a film to act and half a film confined to a wheelchair, severely contorted and with limited ability to verbally communicate. He provides Hawking with a sparkling humanity and humour that transcends his deteriorating physical state. As storytelling the film does suffer from the main subject slipping first into incomprehensibility and then immobility, but Redmayne's greatest feat is keeping a glint in the eye as a reminder that while the body is almost totally failing, the brain is fine, beavering away to theoretically ponder the mysteries of the cosmos. With a central character who gradually descends into a non-communicative state, the emotional centre was always going to be held by Jane, and the film is a tribute to the woman who saved Hawking from himself, gave him the will to live, and supported him through the years of obscurity. As often is the case when playing opposite a dominant physical performance (Jennifer Connelly in A Beautiful Mind, Tom Cruise in Rain Man), Felicity Jones has the more difficult role to remain relevant and grounded, and her performance is a joy. From college student to hardened wife balancing her needs with an impossibly demanding husband, Jones shines as a woman who devotes her life to her love but remains on the real side of saintliness. The Theory Of Everything uncovers the man behind the theories, and more importantly, the great woman who fell in love with a broken man and saved his soul.